Contently, a content marketing company, released a measuring tool Wednesday that tracks engagement rates for downloadable content. 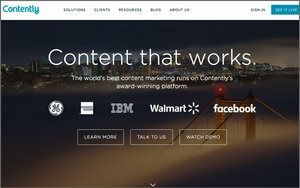 Contently’s Document Analytics adds engagement metrics and predictive recommendations to downloadable content, such as case studies, white papers or sales presentations, to its multichannel content marketing platform. Available metrics include page-by-page engagement analytics and heat maps displaying where readers click, hover or share content. Additional product features include version control, A/B testing and pre-populated text for sharing on social media. Contently’s Document Analytics can also be integrated with marketing automation, CRM and email marketing platforms so marketers can access all email intelligence in one, centralized location. By tracking account or consumer engagement, marketers can optimize their email marketing campaigns with downloadable content that a subscriber might actually need or want. “Document Analytics has helped us to not only improve the quality of our e-books and white papers, but also optimize our entire lead generation strategy,” states Chauncy Freels, marketing analytics lead at Microsoft and Contently customer. With insights from Contently’s Document Analytics, Microsoft personalized marketing content by topic, length and structure to optimize sales opportunities. The platform also helped Microsoft decide the best method to collect email address. Microsoft discovered that landing pages requiring email addresses in exchange for downloadable content were 25% more effective at capturing email leads, but that embedded email forms within freely accessible content was more effective at capturing content reads. Subscribers who entered their emails in embedded forms were 51% more likely to read the entire piece of content, according to a Contently case study. Contently’s new feature derives from the company’s acquisition of Docalytics in February for an undisclosed sum. Docalytics’ marketing tracking and analytics software, Insights Engine, is now directly integrated into Contently’s marketing platform. Docalytics’ marketing tracking and analytics software, Insights Engine, specialized in the ability to track downloadable content such as PDFs. Insights Engine is now directly integrated into Contently’s marketing platform, and marketers can also leverage Docalytics’ lead capture forms directly within Contently.